The younger of the twin Harada sisters, Risa is initially the object of Daisuke's affection. However, she doesn't show the same feelings towards Daisuke as he does for her considering the fact that she feels that he is too normal and only thinks of him as a best friend since he's very kind and nice to her and she can rely on him for anything (to which she uses throughout most of the series). She is a rather naive young girl. Risa starts to develop a crush, then an obsession, with Dark upon seeing his attempt to steal an artwork broadcast over the news claiming that he is the mysterious person whom she is destined to be with. There is an ongoing sisterly rivalry between her and Riku. Compared to her sister she seems more innocent and clumsier and can be seen as your typical "girly-girl" though shows the same stubbornness, tenacity, and kindness as Riku. She would much rather prefer fashion and relationships than to physical activities. In terms of physical features her hair is much longer and she has a "softer voice", apart from that the two can't be distinguished (shown in episode 5 of the anime when the two switch places so Risa can get out of chopping cabbage as a form of afterschool punishment). Risa obsessively pursues Dark, coming up with intricate schemes and plans to make him go out with her, some of which eventually work. There's no doubt that she is quite clever and very persistant. Later on, however, Dark tells her that the two of them cannot see each other anymore. Near the end of the anime, subtle signs of a relationship between Risa and Satoshi start to show. (example: he places her on a park bench and covers her body with his jacket after she fell unconscious during their struggles with Krad. She then wakes up only to find the jacket and a single white feather which fell from it. Although not knowing who the jacket and feather belongs to, she can be seen treasuring it). In the manga this is more apparent, shown through small occurrences (example: he saves her when she fell off a building, when Daisuke saves her from drowning he shows concern and touches a lock of her hair). 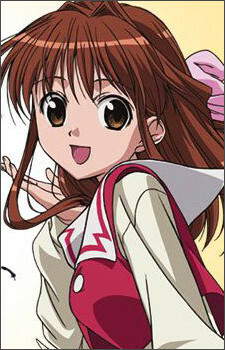 As the series progresses, Risa breaks out of being a naive little girl and develops into a more mature young lady.